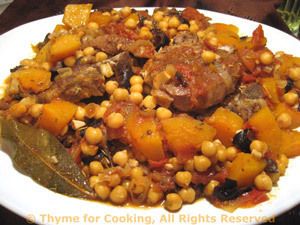 Braised Lamb, Butternut Squash, Chickpeas, Thyme for Cooking easy gourmet dinners. I'm cooking my way around the Mediterranean this winter. The lamb is a Moroccan dish that would, traditionally, be made in a tagine, or baking dish with a high, conical cover. Use one if you have it but any heavy pot or Dutch oven will work. Our little green grocer had some very sweet Medjool dates that inspired this. They were sold individually... I bought 6. They were almost like candy. Pit the olives if needed and cut in half or thirds. Heat oil in medium skillet. Add mushrooms and sauté until golden brown. Add Worcestershire, olives, nuts and sauté 2 minutes longer. Slice cheese into 6 rounds (if small log). Each round should be between 1/4 and 1/3" (.75 - 1cm) thick. Put bread crumbs on a plate. Dip both sides of the cheese in the crumbs and place on a nonstick or lightly oiled baking sheet. Bake, 400F (200C) for 2 - 4 minutes, just until you see the tops sink slightly or cheese ooze slightly. If it hasn't happened after 4 minutes, take them out anyway - they're ready. Spoon the mushroom mixture onto 2 plates. 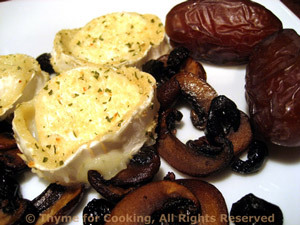 Top with 3 slices of goat cheese; add the dates and serve. This is meant to be like a tagine - which is the name of both the method/type of cooking and the conical-shaped dish they are made in. This should be thick and chunky, with little visible liquid remaining. Couscous is the traditional accompaniment. Pit olives if needed and roughly chop. Heat oil in a heavy pot or Dutch oven with tight-fitting lid. Add lamb and brown on all sides. Remove and set aside. Add the shallots, garlic, paprika and sauté until tender and starting to brown, about 5 minutes. Return the lamb to the pot, add herbs, wine, tomato, chickpeas and squash. Heat chicken broth to boiling. Put couscous in a medium bowl. When broth is boiling pour over couscous, cover and let stand for 10 minutes... Do not stir it. 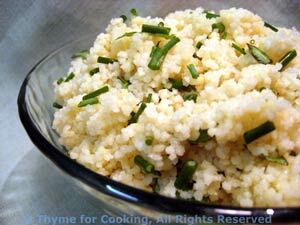 Add herbs and oil to couscous, fluff gently with a fork to combine and serve.